4 days & 4 nights. From 5 days & 5 nights. Global medical check-up to preserve your health capital. From 4 days & 4 nights. Stabilise your glycaemic index and monitor your weight. To bring urine pH into balance and to prevent metabolic disorders. To prepare for your baby's birth serenely. To combat stress and to manage your emotions and work pressure. From 6 days & 6 nights. Improve morale and physical equilibrium. Reduce pain and use less analgesics. Purify and detoxify my body. Relax through the benefits of Vichy thermal water care treatments. The privilege to freely choose your treatments adapted to your needs. Recharge your batteries with specific care treatments! Take time for yourself! and enjoy! Regenerates the cellular activity of your skin with an immediate toning effect. Get back a mineralised, radiant and glowing complexion. "IN VICHY BECOME AN ACTOR OF YOUR HEALTH"
Internationally known as the "Queen of water towns", Vichy is one of the first to develop thermal medicine. The Compagnie de Vichy has been managing the thermal resort since 1853 and is the VICHY CÉLESTINS SPA HÔTEL (Vichy - France) owner. In the concept of global health, VICHY CÉLESTINS SPA HÔTEL offers a tailor-made "Health-Well being-Beauty" treatment programmes: Vichy slimming cure, Vichy detox cure, Vichy well-being cure, Vichy anti-ageing cure, ... The entirety of our treatment programmes is based on the 5 essential principles of the Vichy Method. 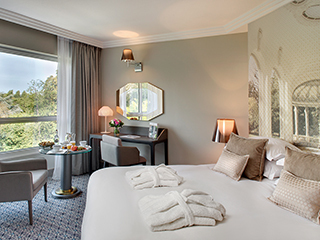 You are welcome to the biggest European medical Thermal Spa connected to the 5 star Vichy Célestins Hotel recently renovated.